The original, millimetrically precision detail focused and the best. Honda set tongues throughout international motoring press wagging when it unveiled the world?s first all-aluminium production car at the 1989 Tokyo Motor Show. A three-dimensional representation of a portfolio expanding shift in the way cars would be built into the future. Based on designs penned by the fabled Pininfarina, featuring a gamut of advanced-tech inspired by Honda?s participation in Formula 1 and tested and refined at the Nurburgring by Ayrton Senna the Honda NSX didn?t just rival the Ferrari F40, Lamborghini Countach, BMW M1, Porsche 959, and Bugatti EB110 among others, it controversially stood head and shoulders above them. Using a mid-engined layout similar to the McLaren-Honda MP4/4 car for stability, a cabin-forward driving position refined with wind tunnel testing and inspired by F-16 fighter aircraft design, an all-aluminium chassis for reduced weight and sporting rigidity, fully independent double wish-bone aluminium suspension borrowed from Honda?s F1 car, driver aid?s like traction control and ABS, functioning aerodynamics and a double overhead-cam, all-aluminium, naturally aspirated VTEC V6 that produces 270 horsepower with an incredibly linear power delivery, the NSX was/still is the one of the greatest supercars ever made. 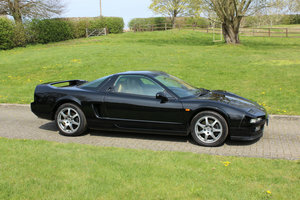 McLaren F1 designer, Gordon Murray profoundly noted, "The moment I drove the 'little' NSX, all the benchmark cars?Ferrari, Porsche, Lamborghini?I had been using as references in the development of my car vanished from my mind". 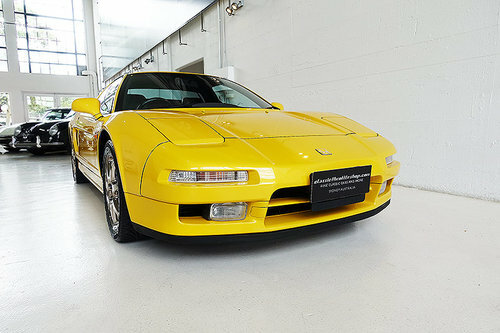 The car offered is a totally original, well optioned and Australian delivered 1995 Honda NSX Type T (?T? refers to the removable Targa roof, which was first offered in 1995) in Spa Yellow Pearl with matching roof over Black leather trim. 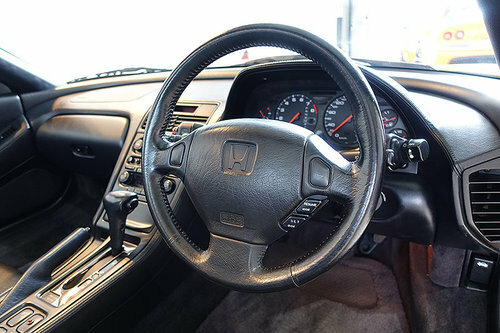 Delivered new by North Honda, Western Australia in 1995 and optioned with the 3.0 litre DOHC, 24-valve V6 engine and 4 speed Sequential SportShift automatic transmission and seven-spoke 16? and 17? 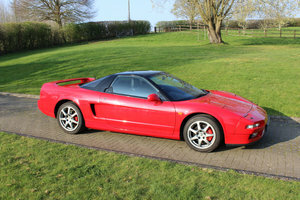 offset alloy wheels, this exhilarating and easy to own modern classic has been exceptionally well maintained. Travelling just 93,000 kilometres from new this rare and uber collectable car isn?t just in out-of-the-box, mint condition, it?s also the most desirable first edition of the Targa top. 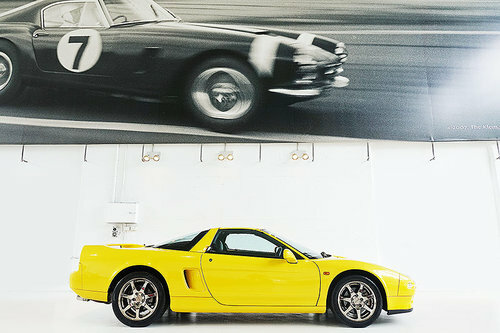 The detailed documents forming this cars history show that it received frequent servicing with limited use and most completed by the factory. 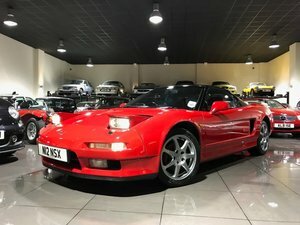 A testament to the meticulous way in which this NSX has been maintained, getting into the racy, forward facing cabin is like taking a step back in time to when the car was new on the showroom floor. 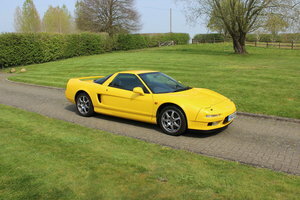 It still carries the new car smell, the multi-function leather steering wheel seems totally untouched, the 90?s switchgear is pristine, so too is the original Honda/Bose stereo and the original NSX embossed carpets. 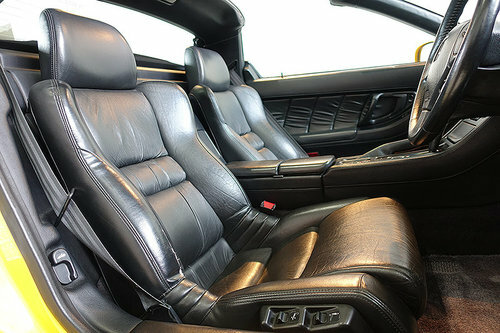 The double stitched Recaro leather seats, gear shifter and hand brake lever are ageless and the overall feeling inside is still so fresh. The exterior has been preserved in the same way. Finer details from the depth of finish to the original paintwork, the presence of the original Temperlight glass and Stanley light lenses are all tell-tale signs of a cherished car. The original and stamped alloy wheels and complete Honda tool-kit are importantly still present too. The yardstick by which all others are measured, Honda?s halo car with its exceptional Japanese build quality, forward thinking technology, real usability and legendary Honda reliability with a proper storage compartment and ergonomically designed interior, air-conditioning that works, a hair raising drive and universal collectability make it one of the most desirable modern classics money can buy. 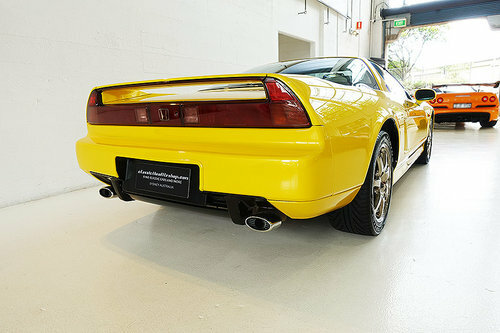 The posterchild for more than one generation with strong links to one of the greatest Formula 1 teams (and arguably driver) of all time this incredibly low kilometre, Australian delivered, totally original and meticulously kept first edition NSX-T is one for the savvy collector.